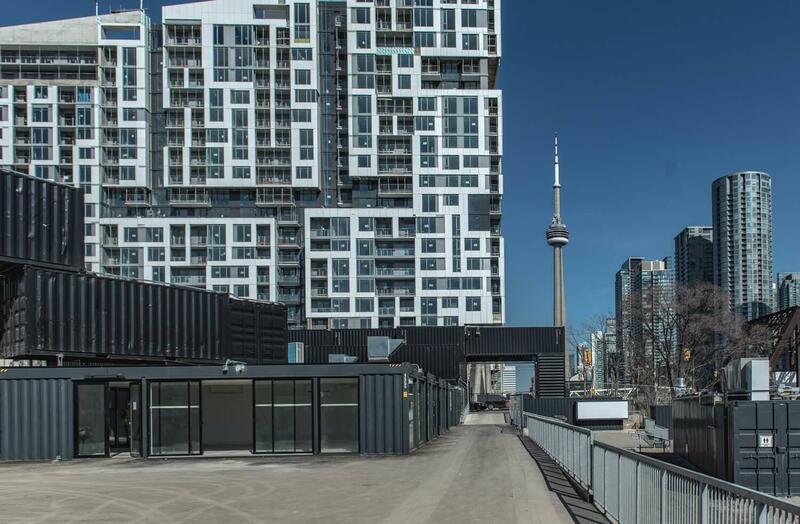 New shipping container market in Toronto now open! For years, we’ve had our eye on the mostly sold out Minto Westside site at Front and Bathurst in Toronto. Aside from it being one of the largest and most architecturally interesting condos in the city, it’s also surrounded by some intriguing parcels of land. To the immediate south, there are the train tracks, which could someday be home to the proposed Rail Deck Park. Further south on the other side of the tracks, there’s space for another proposed park. Directly to the west, on the other side of Bathurst, there’s another site that is destined to be a park, but if you’ve passed this intersection recently, you likely noticed a lot of shipping containers on the land. That’s because stackt, a new and innovative outdoor/indoor market, just opened! stackt is comprised of 120 new and reclaimed shipping containers, designed by LGA Architectural Partners. The market features an array of retail, food & beverage businesses, and services. The idea behind stackt is to be an engaging and ever-changing public space. "The vision for stackt developed while I was living in the area and noticed the lack of an interactive public space, which encourages community connection and engagement," says Matt Rubinoff, Founder of stackt. "With stackt we are developing a community and cultural hub, which will provide the necessary space for Torontonians to gather, connect and discover. I'm excited to open our doors and share with Torontonians all stackt has to offer." There are local and international brands renting space at stackt, and leasing timing ranges from two days to 18 months. That means there will likely be something different every time you visit the market. In addition to featuring retail, food, and services, stackt will be a cultural hub, showcasing artists and engaging public art programming. On the stackt website, you’ll notice things called “Experiences.” These are events and many of them are free. There’s yoga, LGBTQ+ programming, live competitive painting, and even on-the-spot dog portraits. From the looks of it, the majority of the tenants at the moment cater to the downtown, fashion forward, millennial, but it definitely seems like there’s something for everyone. Bank of Montreal even rented a shipping container. "One of our focuses at BMO is looking for ways to continually deliver great experiences for our customers," says Roy Stanjevich, Head, North American Physical Channels, BMO Bank of Montreal. "With stackt, we've built a location with customers and for customers which takes another step towards evolving the experience for when they come to see us. Customers can come into our location and have advice-based conversations with our team members about their everyday banking needs – in a relaxed and convenient environment. The location will also be used as a space for learning as we roll out financial education workshops, tailored to all age groups." Located in the walkable and transit-friendly King West neighbourhood, we feel like stackt is going to be a hot spot! And we heard that Minto Westside has been conducting PDIs, so it’s only a matter of time before owners and tenants are moving into the 600+ units at the condo. We’re positive Minto Westside residents will appreciate having stackt just a stone’s throw away. stackt is open Monday to Saturday from 10 am to 7 pm and on Sundays from 11 am to 6 pm.